Originally based on a dish called “Rigatoni Alfuzio”. Fuzio is a local San Francisco restaurant whose tagline is “Universal Bistro”. I’ve never had anything at Fuzio that I didn’t like (or love). The first time I was taken to Fuzio, I had just started working temp at great law firm. It was my first day. A court reporter came around schmoozing staff and took about 5 of us out to Fuzio for lunch. I was nervous – fancy SF restaurant and me who doesn’t like seafood, I assumed I would find nothing to eat and have nothing to talk about. And then I found Rigatoni Alfuzio. I’ve no recollection of the conversation that day, only the food. How can you go wrong with pasta, garlic sauce, pomodoro (tomato) and bacon? I really don’t think you can! Melt butter and olive oil in a large pan, mix in onion & garlic. Cook over medium heat until onions begin to soften. Add tomatoes and carrots, liberally salt, stir. Allow to cook until just before tomatoes become mush. Mix in flour and cook out 1-2 minutes. Add in half & half. Stir well, you don’t want lumps. Mix in herbs and then cheese – melting completely, then salt and pepper to taste. Turn heat to low until ready to add pasta. When pasta is almost finished, add peas into the boiling water and let cook one minute. Turn off heat under pasta, and turn up the heat over sauce to medium. Using a large slotted spoon, move pasta and peas directly into the sauce (it’s ok if a little pasta water comes with the pasta, this is going to help spread the sauce around your pasta). Add bacon last and allow the entire mixture to cook 1-2 minutes. Why not plant your own herb garden? You don’t need much room or much skill! 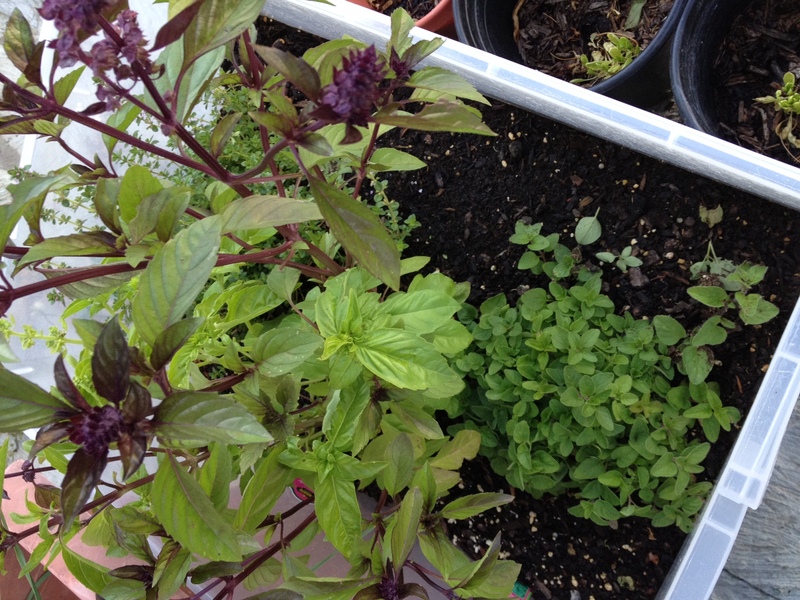 I bought the herbs I use most often pre-sprouted and planted them in plastic containers. 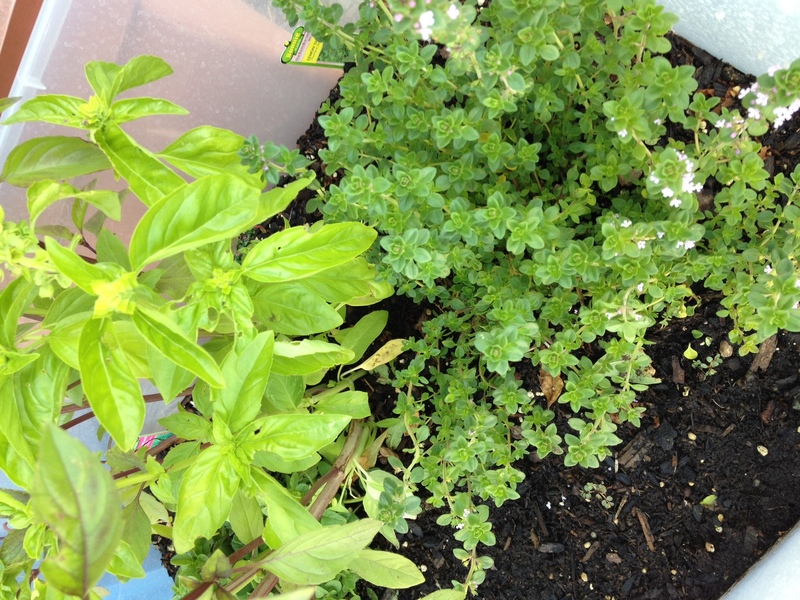 Using SuperSoil’s Planting Compost, I planted my herbs in a large plastic container. They are doing spectacularly well! I would recommend the Planting Compost for any container or ground garden and for any garden beginner; it removes the need to mix fertilizer, dirt and compost. My garden is doing better than it ever has since I switched to Planting Compost. Did you know? Recent scientific studies have shown that the oil in basil has antioxidant, antiviral and antimicrobial properties. Basil has potential for use in treating cancer. Basil is also traditionally used to treat stress, asthma and diabetes in India. Enjoy the last day of Memorial Day weekend! Don’t forget what Memorial Day stands for – take 10 seconds and remember to thank the soldiers who have sacrificed their lives to protect our freedom. They absolutely deserve 10 seconds of our time!! Tags: bacon pasta, basil, food, lemon thyme, recipes, rigatoni, rigatoni alfuzio, romano, tomato. Bookmark the permalink.